Enjoy our warm country welcome at our 3 star Best Western Motel. The Best Western Hospitality Inn Kalgoorlie, offers you everything you need to make your visit to Kalgoorlie relaxing and enjoyable. 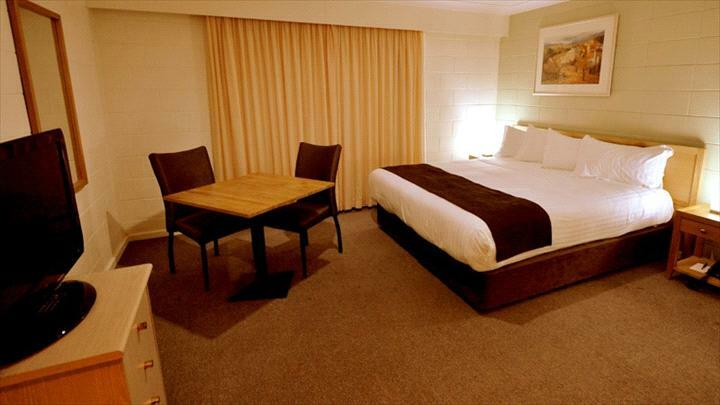 After a full day exploring or working in Kalgoorlie, relax and enjoy a stay with us. Ideally located on Hannan Street, just a short distance from the CBD, the Best Western Hospitality Inn Kalgoorlie offers spacious, affordable and well appointed motel rooms. We offer comfort and country hospitality. Kick start your day with a delicious continental buffet or a freshly cooked to order breakfast. Later, you may then like to cool off in the swimming pool or just relax under the palm trees and enjoy a casual lunch in the attractive BBQ and pool area. Plan your next day's adventure over a quiet drink in our cocktail bar before moving into dinner in our new licensed, a-la-carte restaurant, Katherine Station, where we offer quality cuisine with a distinctly hearty outback Australian theme! We also offer a children's menu for children 12 years and under. Something for every palate. Whatever you choose, it's all made easy by our friendly, efficient staff at the Best Western Hospitality Inn Kalgoorlie. They are always on hand and happy to help you with information on facilities available and any questions you may have to make your stay with us enjoyable. You can rest assured that our standards are second to none and we will offer you a personalized service to make sure your stay is as enjoyable as possible. Located at 560 Hannan Street, Kalgoorlie. The rooms contain a queen and a single (fold out) bed, along with all the modern conveniences expected of a quality Best Western property. Cooked or continental buffet breakfast is available daily in the Katherine Station restaurant, or room service is on offer (breakfast not included in room rate). All rooms are non smoking. One child (12 and under), stays free in existing bedding. Complimentary cots and highchairs are also available. Should the need arise to cancel or reschedule your stay please advise us 24 hours prior to arrival to avoid forfeiting the price of the first nights stay. Hours: 7:00am to 8:00pm, daily.